15600 NE 8th St Suite K10 Bellevue, WA 98008. +972 (0)54 500453 Almost every Friday afternoon in Tel Aviv. Saturday evenings, from 5:00 PM until 9:00 PM. Sitka Jeff Moebus TBD. One prime suspect is the local Japanese Restaurant, which has a Korean Sushi Chef and a Driver who are both very accomplished Baduk player. Will keep Y'All updated on developments. 334-514-8338 Please, email me for meeting time and place. Location and time subject to change. Players are welcome to schedule an appointment. Sundays starting between 4pm and 5pm and going till the place closes around 8pm. Other days available for lower ranked kyu players and beginners. Please call for days and times. All strengths welcome on these days. Bay Area Go Players Assoc. San Francisco Jay Chan 909-618-8749 See Web site for for meeting details. Please check website, as some holidays we may not meet. Google maps has the location correct because I edited it, but most other map services do not have the addresses correct in this area. Every Sunday 5-9 PM at the the Vinaka Cafe. Additional meetings & events will be announced on the Facebook page. During our lunch time from 12:16-12:56 on Mondays. Starting in November 2013, we will meet on every first Monday and third Monday of every month. M - F - Call for time. Sat & Sun - 1:30 pm - ? (925) 422-6780 Panama Red Coffee Co.
Drop in any time (by 4:00 to be assured of getting a game), but RSVPs on our web site are appreciated. Beginners and kids always welcome! Check our website for other details, tournaments, special playing events and occasional holiday cancellations. 805-637-9677 Click on the club title for details. Santa Clara, close to Stevens Creek Blvd & Lawrence Express Way. Please email for address. We meet during the school year. Facebook group for weekly updates. The First Thursday of each month is Beginner's Night. This info last updated Oct 24, 2018. Lakewood indigenous.education.research@gmail.com This program is focused within Jeffco Public Schools -Indian Education Program and is designed as an after school program for American Indian, Alaskan Native, and Native Hawaiian students at Bear Creek HS. Please email ahead so we bring enough boards. If you can't email ahead, please come anyways. John Russell -- Check tampagoclub.com for most up to date meeting info. We meet most Saturdays from 1pm to ~4pm at Obrien's Irish Pub in Tampa. Wednesday meetings are starting at Boba House near USF from 5:30 - 7:30+. You can also find out facebook page from the website. We're looking for new members, and people who want to help out with the club. Currently (2019) we're working on planning a monthly rated games day. Requires AGA membership (send us an email for voucher if you're a new member). Let us know if you want to get involved! This chapter is happy to teach and help new players. You're welcome at any meeting. Ken Luther We currently do not have a set location but for the time being we meet on Sundays from 3-6pm at Miami Dade College Hialeah campus. Call or text Leynier for more information. 904-607-1258 Club is on hiatus. Go contact for greater Jacksonville, FL area. Miami Stefan Kurtenbach, 786-252-4379 and check out out Facebook page! Go club meeting weekly at “the corner” bar in Miami 6pm to open end (usually around 10 pm). 1035 N Miami Ave, Miami, FL 33136. http://www.thecornermiami.com/. Great happy hour till 8pm for food and drinks. The club is free and open to everyone. Players of all levels and people with no Go experience very welcome! Check out and join our facebook group for updates in case we don't meet a certain week. See you soon! in the Graham Center Game Room. in the Graham Center food court. Tallahassee Everyone in the Tallahassee area is welcome to join our Facebook group and attend our events and club meetings. Our meetings are tentative and can be found on the Facebook group. All ranks and beginners are welcome. Coral Gables William Wetmore University of Miami Student Union,br. Last Thurs of th the month,br. Tampa Jonny Heck : complexuji@gmail.com Rollbotto in downtown St. Pete. Ideally we will be meeting from 5 p.m. to 8 p.m. . There is plenty of table space, good food and drinks. It's also right next to the Ale and the Witch for relative location. We look forward to meeting anyone who has the time or even just wants to learn how to play. 727-642-1526 Email us for info and times. Tallahassee brett.castellanos@gmail.com There is no current regular meeting. Please contact me if you are interesting in playing or learning Go. Please call or text if interested in attending. Facebook Website (https://www.facebook.com/groups/SavannahGO/) Please call Matt or visit the Facebook website for meeting places and times. See http//meetup.com/oahugoclub for meeting info. Xiaoxian Wang (Ames): gavinwxx1994@gmail.com This chapter serves as a regional parent chapter, meant to assist all clubs in the Central Iowa area and give them a central focus to ensure a constant presence. Meeting times vary, and are often inter-club efforts. Please contact us or one of the other clubs in the area for meetings! 2nd and 4th Tuesday of the month from 5 p.m. to 9 p.m.
217-348-8869 Game night is Fridays from 6:00 to midnight at the Charleston County Market's mezzanine. We play lots of Go, Mahjong, Poker, Rummy, Chess, Backgammon, Risk, Settlers of Catan, Carcassonne, Dominion, RPGs & more. Please contact me for more info. Bring equipment if you have it. Bring a board if you have one! New Players Welcome, we have equipment. 5706 S. University Ave, Chicago, IL, 60637. 219-302-0049 Tuesdays 6:30-8:45 PM at the Lake County Public Library, 1919 West 81st Ave.
Memberships open to all Rose-Hulman Students, Staff and Faculty. Meeting place and time varies. Email for meeting time and locations. Washington DC Gurujeet Khalsa Meetups around the DC area. Check the website http://www.meetup.com/DC-Area-Go/ for a calendar of events. Baltimore umbcgo@gmail.com Skylight Lounge in the Commons building Tuesday nights at 7pm, Wednesdays in the Student Orgs area in the Commons from 12-2. Thursdays from 7pm in the Student Orgs. Baltimore nate2@umbc.edu Varies semester by semester. Not meeting at the present time. 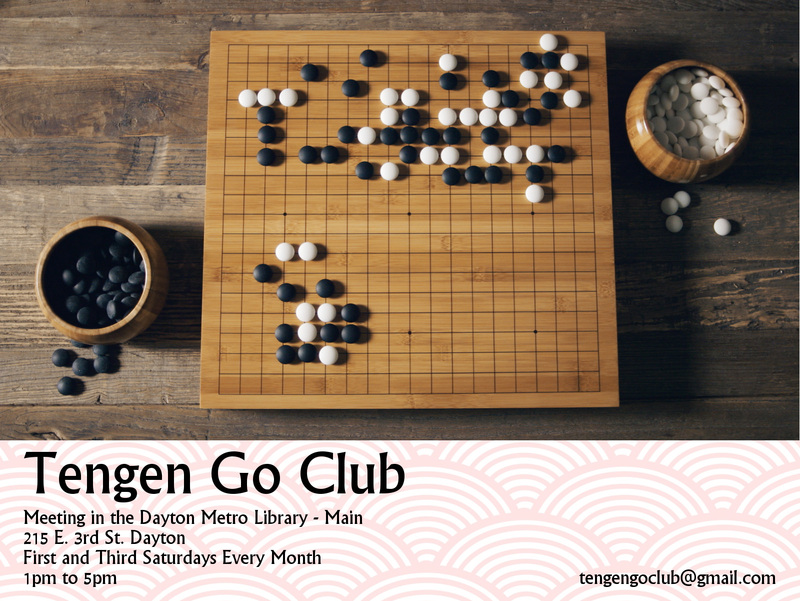 Attend or contact the West Michigan Go Club, which does meet regularly. (269) 350-4842 Please check our website for location information and meeting times. Rochester Chad Sobodash 7:00pm every 2nd and 4th Thursday of the month at the Rochester Hills Public Library. 417-445-5487 We are not currently meeting, but if you are interested in playing or learning how to play Go, feel free to e-mail me. Location: Omaha Public Library - Millard Branch, S of W Center on 132nd St.
Club Membership Fees are waived for Go Players!. The Princeton Area Go Club is not affiliated with Princeton University. Regular meeting times and locations are not yet established. email Rick Mott for current info. 201-612-0852 We are a server neutral virtual go club. We have discontinued regularly scheduled club meetings, but we hope you will enjoy hanging out in the Wings Go Club room 24/7. 505-776-1241 Call for meeting details. IHOP 7430 S Las Vegas Blvd. in the Las Vegas Premium Outlet Mall. Nyack Various Places and times. Often Monday and Friday Evening. New York, NY Randy Au Meetings: Various places and times -- join online (free) and we'll e-mail you when we plan something. Tuesdays and Thursdays 7:30-10:30 PM"
No current venue. Call or email to arrange games. Players wanted! Anyone is welcome, instruction available. Check our group on meetup.com for up-to-date info about meeting times and dates. Rohs Street Cafe (245 W McMillan Street), Sundays 2 - 5 PM. At the Daily Grind in Girard, Ohio. If you live anywhere in Oklahoma, please visit our website by clicking on the chapter name and get in touch. Call to arrange a special game time. 503-768-7539 Trailroom (in Templeton across from the bookstore). Email for info -- the meeting night changes from one semester to the next. 484-431-0153 Houston Hall Main floor. next to La Petite Creperie cafe. 3417 Spruce St. U of P.
Wednesdays at 5:30 PM until 8. 717-2448-0207 6:30-9:00 pm most Sundays at Panera's - 40 Noble Blvd, Carlisle 17013 (near US 81 exit 47) To verify "games on," email Fred -- please do NOT call Panera's. 610-952-2176 Sunday 1:00 pm During School year. Check the Facebook page or Twitter for more info. NOTE: If you are in or near Spartanburg and interested in playing, please contact us as we are considering starting a secondary meetup location in that area. https://www.facebook.com/MidlandsGoClub/ Check Facebook page events for upcoming meetings and events. 901-268-4502 Check http://www.meetup.com/MemphisGoPlayers/ for most current information. See website for most up to date information. Houston Paul Howard, President Houston Go club Tuesday nights @ La Madeline town and country, Thursday nights at the Tea bar on hwy 6 Sugarland, and Saturday mornings at the Memorial City Mall food court. You can follow events on our facebook page "Houston Go club"
Newcomers welcome, kids welcome, teaching games available. Bring your board if you have one, but we have extras! 301-437-9416 Currently we don't meet in a regular basis. However, we may have several events this summer, including go parties, workshops and tournaments. We will post these events on the AGA calendar. We also serve a free virtual library with over 100 issues of Wei Qi Tian Di magazine from China. You may write to with your address and phone # for free borrowing. The first Tuesday of every month is a free drink meeting. Everyone who shows up to play gets one free drink even if it is there first time. I often forget so please remind me. No meetings in the month of December or on federal holidays. Meets at the Seattle Go Center, 700 NE 45th St., Seattle 98105. See http://www.seattlego.org/ for the latest schedule, news and classes. Located in Walla Walla, we are the only Club East of the Cascades. We are 50 minutes SE of Pasco, Richland and Kennewick, and 3 hours S of Spokane. Club Rep "Anthony"
https://www.facebook.com/wallawallagoclub We meet every Wednesday at Sweet Basil Pizzeria in Downtown Walla Walla at 6:00pm, and usually play till closing at 9pm. We welcome players of all ranks and ages and are prepared to instruct new players and get them playing quickly! We also have special GO nights and occasional Asian Movie nights for fun! We play because we enjoy the beauty of the game, the snap and feel of real stones, and meeting interesting people. Hope to see ya there! Bellevue, WA Thane Willliams at https://www.facebook.com/groups/EastsideGo/ Meets Thursdays at 6 p.m., Crossroads Mall, Bellevue WA, inside the mall next to Uncle's Games. Fridays, noon – 1 p.m.
Obsidian, 414 4th Ave E.
Most meetings take place in the UW-Milwaukee Union on Kenwood at Maryland.